Another herb endemic to Crete and growing only on steep rocks is Cretan dittany, Origanum dictamnus, and diktamo or erontas (Love), in Greek. It is a herb with a long story, famous since antiquity.. It is a beautiful, slender plant, clinging to the rocks.. A lot of myths surround this plant.. Aristotle tells, that the goats would seek it when they have been shot, and that eating the herb, the arrow would be driven out of the wound. Hippokratis prescribed dittany for stomach aches and digestive problems. Because of these almost inaccessible natural sites and the dangerous collection, it is now cultivated on Crete. And whereas it had a name and a prize, a value and a superior quality during the ages when it was available only from collections in the wild, it now is widely available in the Cretan market in the cultivated form. However, the cultivated form does not have the same quality at all, compared to the wild form, it didn't really forgive man the attempts to tame it..
And now you can buy cultivated dittany as any other herb in the market, the wild form is not collected any more, as it has lost its age-old fame and value, as well as its prize..
We are collecting Diktamus from the wild populations, for our own use and also for our little shop. The plants are slender, and the leaves very light.. In a whole day of climbing and collecting carefully, we can maybe collect 800 gram..
One has not only to be very careful in climbing, but it is also important to just cut the leaves and leave the roots, as it is a perennial plant..
And here you see Ina Hviding, our friend from Norway high above on the rocks.. Its Ina who took these wonderful and rare photos of the wild growing Origanum dictamnus plants! Oh, here some sheep on their way up.. but we were faster!!!!! Our friend Dominique from Nomikiana came with us to collect.. Here you see the dirt road below, and the first plant we encountered..
We are over 1000 meters high..
and here, its me and our dear friend Wilhelmina, 'Willy' from Holland..in our little Cafe..
Next was savory down by Frangokastello.. Ina, a friend from Norway took the pictures..
And here she is, Ina, cutting Savory..
its a week now, that I opened this little cafe here up in the mountains, and now people stop to have an espresso, a cappuccino, a homemade lemonade or an organic wine with whatever I have to offer... and then people take a soap, a herb, an essential oil as well. 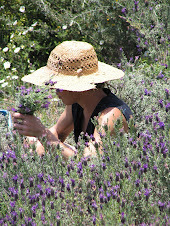 to our blog about wildcrafted herb collections and distillation of essential oils, life in Crete's wild aromatic nature and more.. See also wildherbsofcrete.com for detailed information about us, the plants, collection and distillation, uses of essential oils and much more..